In a recent post ” Chicago Web Designer: The power of 10” I alluded to the fact I strive to write 10 blog posts a month. That really doesn’t seem that many but after writing for 5 years, read my first blog post here , keeping this live and interesting can be a challenge. Looking at my blog stats I am falling a just little short of my monthly goal! So what are the main challenges of writing a business blog? I keep a running list of topics to write about which really helps the despair of sitting down to a white screen and drawing a blank. The nature of my business means it is important I keep abreast of all the latest technologies and how they can impact my clients, from design trends, coding languages, communication and marketing tools , where were Twitter and Facebook five years ago? This evolution of technology provides a good source of fresh content. Sometimes, especially recently, following my move to Chicago, there are just not enough hours in the day to accomplish all I need to do. It is easy to let blogging to fall to the way side. However blogging is an important part of my internet marketing strategy so I make a concerted effort not to let things slip. Setting aside half an hour,after pressing emails have been dealt with, first thing in the morning works best for me. It is important to select a blogging platform that can accommodate your requirements as you evolve. For my business it was important that all blog posts could be stored on our server rather than a third party server. I started off using Blogger but they moved away from the self hosted functionality earlier this year. I then transferred to WordPress which is a self hosted application. How about you, what challenges do you face writing a business blog? Any savvy small business owner will have a carefully crafted online marketing plan, it may include a lead generating web site, a monthly newsletter blast and even a blog. Blogging is much more than a passing trend and is here to stay as an invaluable cheap ( free!) tool. However to be effective a blog must be written on a regular basis and this definitely requires a substantial commitment. Making time in your work schedule and coming up with interesting/relevant/unique content can be challenging. Writing a new blog post is far too easy to push down to the bottom of your to-do list. So is it worth the effort? When it comes to a blog you reap what you sow. Just take a look at the follow five things that can be achieved by blogging. Do you offer a unique service or approach to problems? Are you an IT expert who can offer easy everyday tips to keep a home PC running smoothly? Blogging about your area of expertise will help build and maintain your credibility as an expert in your field. There is nothing search engines love more than fresh content and blogs are a great way to deliver that content. Think about the key words and phrases you would like to target and include them in both the title and body of your posts. Promoting a new product or service, have any special offers? Because blog posts are quickly picked up by the search engines they can act as great landing pages to engage your visitors. Be sure to include a call on action in these types of posts. It is also important that your blog appears as a seamless part of your corporate web site so visitors can easily navigate around. Blogging offers a great platform for less formal thoughts or ideas that may not be suitable within the confines of a corporate web site. You can be personable and conversational. Through blog comments you can interact with your visitors on a different level. Don’t worry about spam or detrimental comments. As a blog administrator you are always given the option whether or not to publish. So is writing a blog worth the effort? I think it is. Blogging regularly about topics relevant to your business and target audience is a fabulous way to increase your visibility among the search engines. Over the last year the client web sites I have launched with blogs, get listed faster and rank higher with the major search engines. For search engines, content is king and blogs, by their very nature, rule the day with their fresh new content. Whatever your area of business blogging is a great platform on which to build your authority and reputation. Write about issues relevant to your services, use your blog to pose questions to your readers, offer solutions to problems. Your expertise will show through. Engage with your readers through blog comments and don’t worry about your blog being blighted by spam. All good blog platforms have the ability to moderate comments, they can be configured so you can see the comments and approve them before they appear on your site. If you can commit to writing a post at least once a week then a blog can definitely help your business. I have been using Twitter on a regular basis for nearly 7 months now, the results of my experiment started back in April are ready to be published! In that time I have tweeted 315 times and amassed 343 followers and followed 442 tweeters. Not huge numbers but I belong to the quality vs quantity school of thought. This is the big one. Can I use twitter to secure new projects? Can Tweeting increase the traffic to my website? I have promoted every new blog post using www.bit.ly to shorten URL’s and track click though rates. I have seen a definite increase in traffic to my blog, so the answer is YES! More traffic is a good thing. A client of mine recently experienced the viral nature of Twitter with an enormous spike of hits to their site. It was due to a British actor picking up on a blog post they had written and tweeting about it. What other ways can I use Twitter to help my business? Twitter has been a useful tool for trouble shooting. I have had questions quickly answered on problems I was having with Quickbooks and a Dreamweaver quirk. Tweets pertaining to problems really benefit from using # tags e.g #dreamweaver or #HTML. If you are blogging for business, pleasure or both there will be days /weeks, when you come up empty in creating that next killer blog post. Welcome to Bloggers Block . Here are some of the tips I use to keep those creative juices flowing. Keep a running list of blog post ideas and add to it frequently – skim over your list and pick something that appeals to you. Think about recent interactions with clients. What types of questions have they asked. Can they be worked into a blog post? Got a new client, launched a new project or service? Blow your own trumpet and blog about it. Flick though a magazine or newsletter relevant to your business, industry or organization. An image or article may be all the inspiration needed. Member of any social networking sites, Twitter, Facebook LinkedIn? Check what’s happening with your friends/followers. Get away from your computer. Sitting in front of a blank “New Post” screen desperately thinking of something to share is not conducive to ideas. Go for a walk, have a cup of coffee, crank up your favorite music on your ipod. Lastly don’t sweat! While posting to a blog regularly is important missing the odd day or even week is not the end of the world. 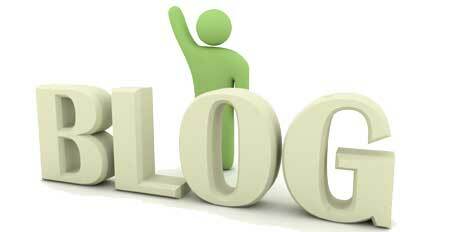 Adding a blog to your Internet Marketing mix? 2009 brings us to our 4th year of blogging, which is not bad considering our blog was started as an experiment. To search engines, like Google, content is king and fresh content rules the day. Writing regular posts on topics relevant to your business will help people find your web site more easily as Google will visit your site more frequently and quickly index anything new. Blogs can really help your page rank too. If you are looking to add a blog to your internet marketing mix contact us to learn how we can help.